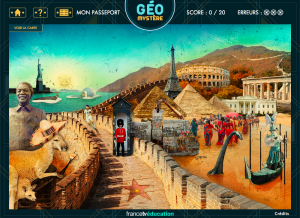 Géo Mystère Planet Nemo / FranceTVEducation (France), FranceTVEducation (France), 2016 Play it Now ! Test your knowledge of geography, finding the names of cities or countries on photomontages including clues and symbols. Once the city or country is found, the player will place them on a world map to locate them.